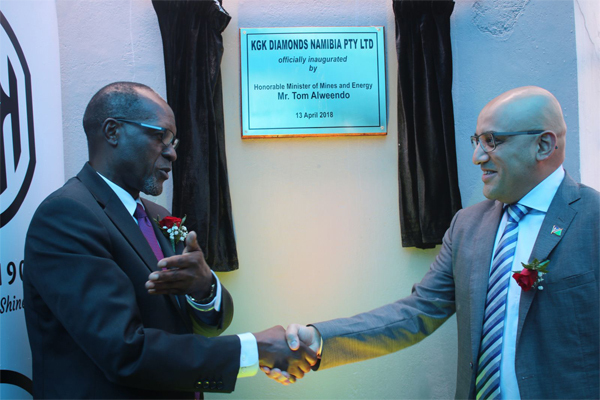 KGK, the global Diamond manufacturing giant and a DTC Sightholder has expanded operations in Namibia by investing in a state of the art factory to cut and polish Diamonds. Tom Alweendo, Mines and energy minister, inaugurated the new set up. This initiative of KGK Group will not only help generate employment opportunities to the local Namibians, but will also mark the beginning of KGK's Industry support and initiatives in Namibia. KGK Group apart from enjoying a leadership status in Diamond manufacturing and production of Diamond jewellery is also known for its employee welfare and social initiatives. Alweendo described the coming in of the KGK group as a "Major milestone for the cutting and polishing industry in Namibia, and added, "We strongly believe that the improved terms of the new Agreement would result in increased opportunities for job creation, skills transfer, investment in infrastructure and technology, and a further integration and empowerment of Namibian citizens at all stages of the diamond value chain. All of which we are witnessing here today." According to KGK group, its investments in state of the art technological knowhow such as Waterjet laser and Galaxy Ultra will only benefit the Namibian Diamond sector and will cushion its intent to create finest products for the world. Namibian diamonds will be marketed through KGK's offices in 18 countries across the world. The group also said it had identified five competent Namibians who will be leaving for India this week to attend a comprehensive training programme at KGK in India.